There was a Apparel Exhibition at Jawahar Kala Kendra this Sunday. I spotted these spare Empty Frames near Parijaat Art Gallery, where the clothes were on display. On most of the frames they hung clothes using multiple metal hangers. These Spare Empty Frames provided me with an opportunity to click a Minimalism as Simple Geometry Photograph. 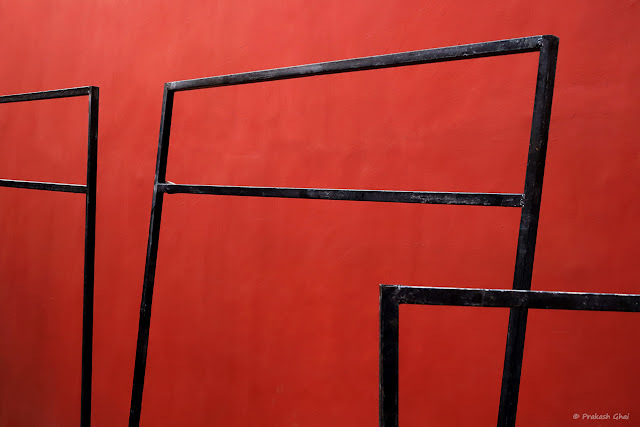 The Minimalist View says, that these are Black Lines (Simple Geometry) against Red Walls. Only 2 elements and therefore very Minimalist. Hope you enjoyed the Empty Frames Minimalist Photograph.